This Limited Edition Extended Director’s Cut* with over 45 minutes of new scenes, is not available in DVD stores! “Generation Iron” follows the world’s top seven bodybuilders as they fight to bring home the coveted Mr. Olympia title. The film features current Mr. Olympia title holder Phil Heath, along with Kai Greene, Branch Warren, Dennis Wolf, Ben Pakulski, Hidetada Yamagishi and Roelly Winklaar. Over 45 Minutes of Footage Never Seen Before. The Making of Generation Iron Featurette. Feature Commentary with Phil Heath and Director Vlad Yudin. Uncut Interviews with Phil Heath, Kai Greene and Lou Ferrigno. Collectable Limited Edition Artwork (Not Available in Stores). English and Spanish Subtitles (en Español). 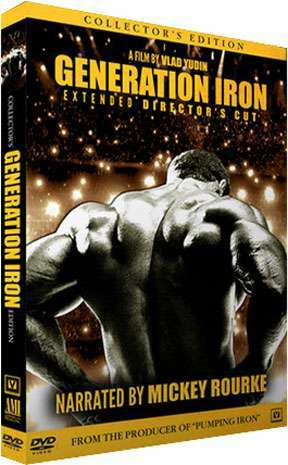 “Generation Iron” follows the world’s top seven bodybuilders as they fight to bring home the coveted Mr. Olympia title. The film features current Mr. Olympia title holder Phil Heath, along with Kai Greene, Branch Warren, Dennis Wolf, Ben Pakulski, Hidetada Yamagishi and Roelly Winklaar. The film gives front row access to the lives of these top 7 bodybuilders in the sport. Mickey Rourke narrates the film, with appearances by Arnold Schwarzenegger, Lou Ferrigno and Jay Cutler. It is produced by Vlad Yudin and Edwin Mejia. Jerome Gary, producer of the cult classic PUMPING IRON, which helped make Arnold Schwarzenegger a household name, is executive producer. Vlad Yudin started shooting the film in July 2012, following athletes as they train and travel from Brooklyn, NY to Venice, Calif., to compete in what’s considered the Super Bowl of bodybuilding, the 2012 Mr. Olympia in Las Vegas, Nevada. A film by Vlad Yudin, narrated by Mickey Rourke. The time is now to place your order for this amazing and much anticipated DVD. Generation Iron came out on April 4th on DVD and Blu-Ray! This Limited Edition Extended Director’s Cut* with over 45 minutes of new scenes, is not available in DVD stores! EXCLUSIVE TO DVD BONUS FEATURES:Over 45 Minutes of Footage Never Seen Before.4 Deleted Scenes.The Making of Generation Iron Featurette.Feature Commentary with Phil Heath and Director Vlad Yudin.Uncut Interviews with Phil Heath, Kai Greene and Lou Ferrigno.Collectable Limited Edition Artwork (Not Available in Stores).English and Spanish Subtitles (en Español). “Generation Iron” follows the world’s top seven bodybuilders as they fight to bring home the coveted Mr. Olympia title. The film features current Mr. Olympia title holder Phil Heath, along with Kai Greene, Branch Warren, Dennis Wolf, Ben Pakulski, Hidetada Yamagishi and Roelly Winklaar.The film gives front row access to the lives of these top 7 bodybuilders in the sport. Mickey Rourke narrates the film, with appearances by Arnold Schwarzenegger, Lou Ferrigno and Jay Cutler. It is produced by Vlad Yudin and Edwin Mejia. Jerome Gary, producer of the cult classic PUMPING IRON, which helped make Arnold Schwarzenegger a household name, is executive producer.